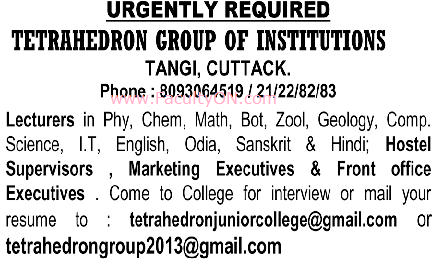 Tetrahedron Group of Institutions, Cuttack has advertised in the SAMAJA newspaper for recruitment of Teaching Faculty- Lecturers Plus Non-Faculty jobs vacancies. Interested and eligible job aspirants are requested to apply / walk-in immediately from 01st October 2018. Check out further more details below. About College: Tetrahedron Junior Science College Established on 2013 is an ideal residential science college with quality classroom coaching for a bright , beautiful & meaningful career of the students. Our objectives is to impart intensive & extensive teaching among every section of our society. Tetrahedron Junior Science College tries its best to innovate scientific knowledge among students. The objective is to popularize science education among every section of our students in our society. How to Apply: Interested and eligible candidates are requested to attend the Walk-in interview along with CV, originals & copies of certificates, PAN card, Aadhaar card and recent passport size photos to the college address provided below or send resume to the email address given below.